By default, your help site will run on a URL like site.helpdocsonline.com. The first thing you will need to do is set up the CNAME record for the domain name you want to use. You add the CNAME with the DNS host you purchased the domain name through. For example, if you bought the domain name from Go Daddy, you will need to log in to your Go Daddy account. The company that manages your DNS is often different than the company that hosts your website. You may even need to ask the DNS host to add the CNAME record for you. Here is a quick example of how to add a CNAME to a Go Daddy account. Log in to your Go Daddy account, locate the domain name you want to use, and select the DNS manager. Then locate the CNAME (Alias) table, and click Quick Add. 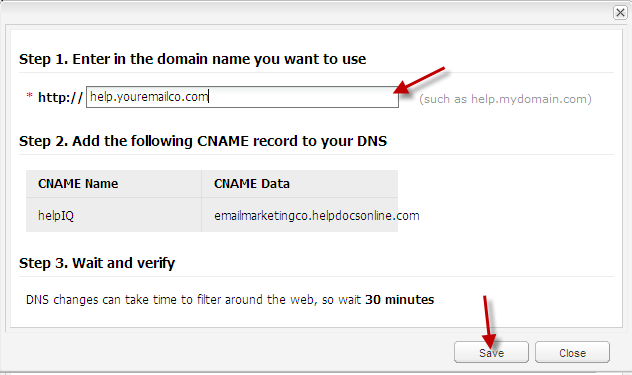 In the screenshot below you can see how a CNAME record gets added for the domain youremailco.com. The Points to must be the URL of your .helpdocsonline.com site. For example, if your site's ProProfs URL is http://site.helpdocsonline.com you would enter site.helpdocsonline.com (do not add "www." or "http://"). For TTL (time to live) select 1 Hour. Note: Changes usually take 1 hour. However, it may take up to 48 hours for these changes to take effect. Once you have your CNAME set up, and you have waited for the update to propagate, you can set up the custom domain in ProProfs. Select the site you want to set up the custom domain for. Click Set up your own domain. An overlay will appear. In the overlay, type in the name of the custom domain you set up in Step 1. For example, help.mydomain.com. Once Save is clicked, ProProfs will immediately verify the CNAME. If the CNAME record is not updated yet or is not set up correctly, you will see an error. If this happens, just wait a bit longer and try again. If after a few days you are still not able to set up a custom domain, there is probably an issue with the way the DNS CNAME is set up. The first step is to troubleshoot the DNS record. You can use a third-party tool such as www.intodns.com to check the CNAME record to see whether it is correct. If the record does not look correct, you will need to contact your DNS host to help you. If everything looks okay, then please contact our support team at support@ProProfs.com. Once you setup your custom domain name SSL (https://) will no longer work. The reason is because the SSL certificate is granted to *.helpdocsonline.com. When you try to run SSL on your domain such as https://help.url.com there will be a security error. To resolve this we can install a custom SSL certificate for your domain name. If you plan on having multiple ProProfs sites then you will need to purchase a wildcard SSL. Our server type is Apache + Open SSL. You will need to set up a custom domain as defined above. Next step is sent us given files - Key file, Certificate file, required chain files. You can use wildcard files(*.yourdoman.com) in case of multiple subdomains. Send us these files to us. We will enable SSL to you. This feature is only available for 'Business' and 'Enterprise' users. Next to the Site Address click Remove this Domain.